In honor of Father's Day we post this new use for an old classic. It would be the perfect gadget gift for father's who are Apple enthusiast., if only it were available at the Apple store on the corner. A couple weeks ago Site Hirac posted a new-slash-old iPad holder prototype. Site Hirac is a Japanese blog site, but you don't need YouTube subtitles to get the idea. 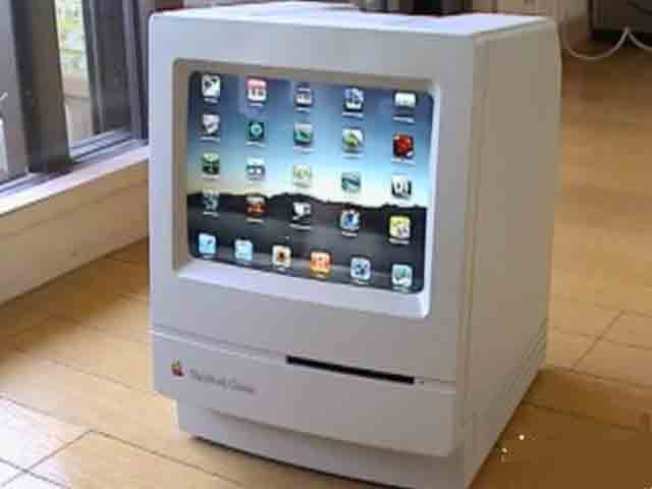 The one of a kind Macintosh Classic opens to become a iPad stand. The face opens and the new iPad is inserted. It's freaky that the two screens are basically the same size. Just close the door and you have a nice little frame for your iPad. Everything works at the touch of your finger and you get a real Apple feel to the process. Who knows? A Silicon Valley entrepreneur just might design something to make this available on a mass scale.